Price Lechleiter checks the make and model of the dishwasher to add to the listing description. Technology has a way of devastating industries, and as early as 1997 a national journal predicted a dire future for the real estate profession. Incredible advances in technology would put Realtors – along with travel agents – on the endangered species list. Homebuyers and sellers would have all the sophisticated tools needed for do-it-yourself real estate, pushing Realtors into the background. Like Neo in “The Matrix,” an interested buyer would be able to plug into their computer and tour a three-bedroom, one-and-a-half bath ranch, complete with a glowing fire in the hearth and birds playing outside. And, that article in the Journal of Real Estate Portfolio Management almost got it right. Technology has changed the real estate business, but it turns out no amount of house shopping online can replace the human touch. Price Lechleiter, managing broker of Pilkerton Realtors in Nashville, says the Realtors who last in the profession are the ones who focus on developing relationships and taking care of their clients. Lechleiter was around when agents were limited to using the multiple listing service bound in a thick, phone book-like tome. “The MLS book contained pages and pages of terrible black and white photographs and brief descriptions,’’ Lechleiter explains. “It was divided by section of town to make it easier to look for properties in certain areas. Now, Realtors – and everyone else – has all kinds of access to the residential market. Technology by Matterpower now allows buyers to do three-dimensional flythroughs of a home on any mobile or desktop device – and support for Oculus Rift virtual reality helmets is coming. Buyers are taking advantage of the ability to house shop online. While they can’t click on a home and buy it like they can a Fitbit 2 on eBay, nine in 10 buyers rely on the internet as their primary source of research. What’s more, 51 percent of those buyers end up purchasing a house they found online. Both stats come courtesy of a joint study by the National Association of Realtors and Google. Not only can buyers in Nashville find their future home while sitting at the Parthenon, they can also download apps developed by Zillow, Homes.com and Trulia that will notify them when a house in their desired neighborhood and at their preferred price point goes on the market. Instead of selling fewer homes, agents today are in the midst of the biggest upswing in sales since the height of the real estate boom in the early to mid-2000s, aided in part by historically low interest rates. Greater Nashville Realtors data show nearly 39,000 properties exchanged hands in the city in 2016. This brings sales close to the point seen at the height of the real estate boom in the early to mid-2000s – just over 40,000 units in 2005 – despite a shrinking inventory. This uptick comes at a time when people are using Realtors more than ever. The NAR reports that 88 percent of buyers in 2015 purchased their home through a real estate agent or broker – a share that has steadily increased from 69 percent in 2001. Meanwhile, for-sale-by-owner (FSBO) transactions fell to eight percent in the same year – the lowest since 1981. Realtor commissions have seen an uptick, as well. In a Washington Post article entitled, “The real estate industry has something the Internet can’t offer: the human element,” reporter Todd Frankel noted that the average commission for a median-priced U.S. home in 1997 was $16,600, adjusted for inflation. Today, that figure stands at $20,131. Frankel took a stab at suggesting why commission rates have not fallen, pointing to the complex and sizable nature of a home sale, regulations that have slowed the pace of change and the work of the NAR to strengthen the role of agents through advertising and lobbying. But he concludes that experts do not know why Realtor commissions have survived the online blitzkrieg. Frankel suggests another possible answer in the title of his article: While the internet and the latest technologies have their uses, they are a cold replacement for something only a Realtor can offer: the human touch. Lechleiter also says he believes in the importance of developing a personal relationship with a client and spares no opportunity to do so. When showing houses to out-of-town buyers, he judiciously creates an environment in which he and the clients can get acquainted. Knowing his buyers will be apprehensive about being in unfamiliar territory, Lechleiter invites them to meet him first at his office, where he shows them a large map of Nashville. He then gives them a small map that indicates the locations of the properties they’ll be viewing. This allows the clients to relax, focus on the task at hand and get to know their Realtor. Nashville Realtor Christie Wilson agrees that trust is an essential component of the relationship between a client and a Realtor. Wilson is owner of The Wilson Group Real Estate Services, which is home to about 50 of the more than 4,000 Realtors who are competing for business in Music City. Nashville has many qualified buyers but not a lot of product. “Things move fast in our market, so buyers need someone they can trust on their side – and trust can come only from a face-to-face encounter. They need to see that you have their back, hear the empathy in your voice for what they’re going through and understand that you’re in control and will get them to the closing table,” Wilson explains. “Sellers need to feel confident that you will secure the right deal on their behalf. Sitting down with them at their kitchen table and talking with them is part of that process,” Wilson adds. This is even true of millennials, whom many Realtors wrongly assume prefer to use technology to get the job done, says Doug Edrington, a Chattanooga Realtor and tech guru at Berkshire Hathaway. While the development of a personal bond is not mandatory to helping a buyer find a house, Wilson says the better she knows her clients, the more equipped she is to find a home they will love. Plus, the bond that is formed is often strong enough to forge a friendship. 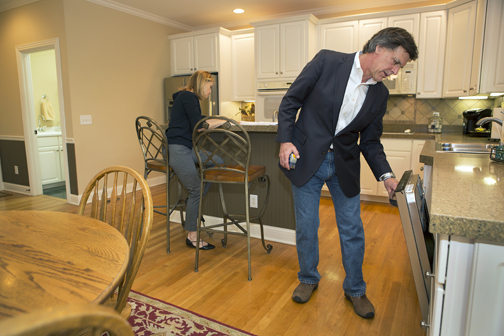 As Realtors and clients view homes, make offers and work their way through the inspection, appraisal and financing processes, they spend a lot of time together. This gives the closing table a bittersweet component. Perhaps Lechleiter says it best when he compares the use of a Realtor to that of hiring an attorney or doctor. Although Realtors can breathe easy knowing they are still essential to the buying and selling of homes, they are not off the hook when it comes to using technology. As more agents become tech savvy, everyone will be forced to adapt or go the way of the travel agent. The trick will be utilizing the tools to build bridges to customers. The NRA suggests the majority of agents have welcomed the new gadgets and ground-breaking apps. Wilson has the solution for agents who need less FaceTime and more face time: networking. “Networking is important. People who are new to the business think their friends are going to use them to buy and sell but often, your friend won’t want to use you as a Realtor; they’ll continue to think of you as a friend and use one of the other dozen or so Realtors they know. So, I’m always telling agents to get outside their friend group,” Wilson says. She adds agents must be consistently seen and engaged in order for their networking to be effective. “You can’t be a one-hit wonder at a Chamber of Commerce meeting because no one will remember you. Find something you enjoy and will continue to do, whether it’s being plugged in at the nonprofit level, your kids’ school, or your church,” she says. The importance of networking is just one more example of how real estate is not about leveraging technology to make a sale but about the relationship that is formed after two people connect through the digital world and together begin one of the most courageous, emotional and gratifying adventures life has to offer.